ExpenseFL is a free expense tracker app for Windows 8 that helps you to track expenses and the areas where you are expending a considerable amount of money. The app lets you save records of the expenses along with their details, like Date, Category, Currency (such as USD, GBP, EUR, etc. ), Tax, and many more. Plus you can also attach the snapshot of bill amount or any other image to the record for a reference. You can also sort these expense records according to three categories: by month, by status, and by affectation. The app also lets you share the expense records with your accountant or anyone else which might help you to get a proper control over your expenses. The app is actually developed for the people who are into some business, as the money factor is very important for any business and maintaining records of the expenses and tracking them is really hard. This app is a great solution for such kind of problems. 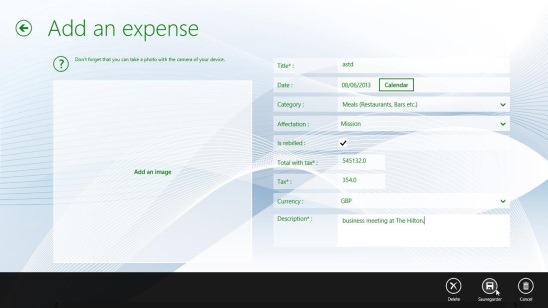 You can get this free expense tracker app for Windows 8 in the Business Category in Windows Store. ExpenseFL is a great app, and completely does what it advertises. The app comes up with metro user interface, which is nicely designed. Navigation is smooth and buttons are pretty easy to operate as each is self explanatory. Switching between various screens within this free expense tracker app for Windows 8, is very quick. The Home screen of the app displays a perfect business theme. 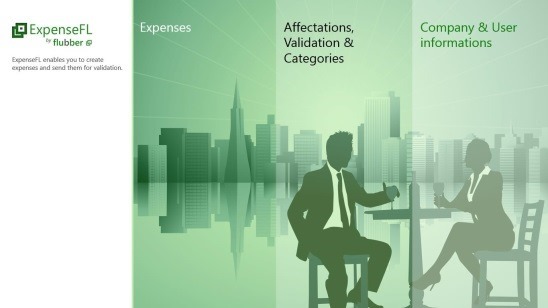 From here you can add new records for the expenses, or make changes (includes adding, editing, and deleting) to the details of various entities that are related to the expenses, such as: details of person who does the validation of expenses, factors that affect expenses, expense categories, and your own or company’s details. Follows a screenshot of the expenses record within the app, and as mentioned you can sort these records according to month of expense, status and their affectations. From this screen click on the + button to add a new entry for an expense. Fill-in the details and attach an image if required and click on Sauvegarder button to save it. After saving these records, the app lets you to share the expense record with accountant, boss, senior, or anyone else. Simply use the Windows Search Charm to share the selected record. The records are sent as XLS spreadsheet attachment with the email. 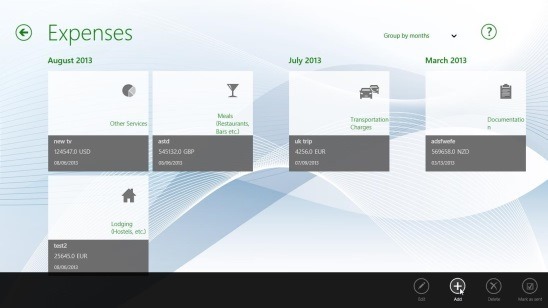 Good Expense tracker app for Windows 8. Option to save multiple details that helps in easily understanding expenses. Option to attach images for better references with the expense record. Multiple inbuilt categories to choose form such as: meals, transportation charges, advertising, phone and internet, etc. Can also add custom categories. Share the record in XLS Spreadsheet format with the mail. ExpenseFL is a nice sleek app for tracking, and hence managing your expenses. With the help of this free expense tracker app for Windows 8 you can find out which areas are making you expend more, and hence gain a proper control over the useless expenses. Though the app needs Home button, plus changing the status of records from not sent to sent after sharing didn’t work in my case. Still it’s a handy app and does worth a try.